Born Beatrice Mary Claxton in Sheffield, UK, into a family of acrobats, Ena (sometimes Ina, or Eva) Bertoldi (or Bertholdi) made her stage debut at the age of eight, touring Britain throughout the late 1880s, often performing in circuses. The Howard Athenaeum Speciality Co. brought Bertoldi, ‘a charming conversationalist and an accomplished musician’, to the USA in 1891. In 1893 she was being introduced to American audiences as ‘an importation from the Cirque, Paris’The films, Bertholdi (Mouth Support) and Bertholdi (Table Contortion), taken at the Black Maria studio, West Orange, were among the first selection to be exhibited at the original Kinetoscope parlour, Broadway, New York from 14 April 1894. An illustrated article in The Royal Magazine shows that the feats were the mainstay of her act, stating that 'Bertoldi places every reliance upon the strength of a magnificently perfect set of teeth and, of course, her powers of equipoise'. 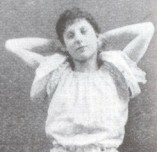 A feature in the Mansfield Daily Shield in 1894, ‘Stands on her chin’, described her as The Feminine Sandow: ‘Miss Bertoldi is very young, lady-like, doesn’t like to see women smoke, does wear corsets and is considered by doctors before whom she has appeared as altogether a most extraordinary young woman. She is hardly five feet tall, weighs about one hundred pounds...’ The young acrobat declared, ‘You know, really I believe all my joints are unhung or out, or something that makes me able to do these things without feeling.’ In June 1895 she was reported in the New York Times as playing her farewell week in America, but by December 1896 Bertoldi was performing in Boston, ‘the pretty contortionist who causes a doubt in one’s mind as to the presence of bones in her body.’ She married British music hall performer 'Dandy George Spink' that same year, and died of alcoholism at Balham, London, ten years later, aged twenty-nine. 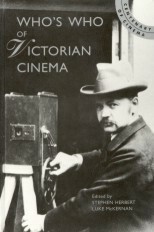 Spink (1869-1947) appears with his dog Rosie as Dandy George and Rosie (1927) in a short film made with the DeForest Phonofilm sound-on-film system. Among the many acrobat, dancers and variety turns performing for the Kinetoscope 1893-95, of whom very little else is known except that they had usually appeared at New York's Koster & Bial's Music Hall, were voluptuous Spanish dancer Carmencita, French dancer Armand d'Ary (real name Marthe Armandary), Mexican tightrope dancer Juan Caicedo, comic boxers the Glenroy Brothers, further comic boxers Walton (Charles F.) and Slavin (John C.), genuine boxers Mike Leonard and Jack Cushing, Spanish contortionist Louis Martinelli, Gaiety Girls Lucy Murray and May Lucas, the Rixfords troupe of acrobats, Robetta and Doretto in a Chinese laundry, Princess Ali with her Dance du Ventre (belly dance), George Layman (the original 'man with a thousand faces'), several artists from Buffalo Bill Cody's Wild West show, casts of shows such as Charles Hoyt's A Milk White Flag, and numerous performing animals. (See individual entries for some of the performers: Eugen Sandow, Fred Ott, Jim Corbett, Annabelle, Buffalo Bill Cody, Joe Rastus and others (The Pickanninies) and Ruth St Denis).